Brown rot is the most serious disease of stone fruits in Maine. It is caused by the fungus Monilinia fructicola. Affected fruits include peaches, plums, cherries, apricots, and other Prunus species. The disease is highly destructive and can ruin half or more of the fruit before harvest with the remaining fruit subject to post-harvest infection. 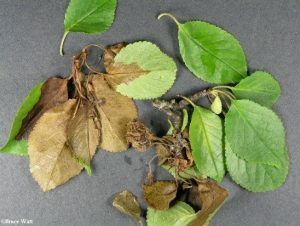 Additional losses are caused by blighting of flowers and twigs. Brown rot is first seen as brown spots on the blossoms in the spring. The blossoms are soon blighted entirely and the infection can grow into the woody tissue producing cankers which may kill the entire twig (Fig.1). Such infections may be accompanied by the production of a gummy exudate. Under wet, humid conditions powdery-gray tufts of spores (conidia, Figs. 2,3,4) can be observed especially on the dead flowers. Conidia produced from these initial infections are responsible for fruit infections (Fig.5) later in the summer. Microconidia (Fig.6) may also be produced but their role in the infection process is not known. Young, immature fruit is generally resistant to infection and when infection does occur it remains dormant until the fruit matures. Infections of mature fruit first appear as brown spots which rapidly consume the entire fruit. 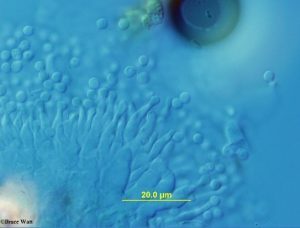 Tufts of tan conidia are produced on infected fruit and the fruit eventually dry up and shrivel. Such fruit are called “mummies” and they may remain on the tree throughout the winter or they may fall to the ground. 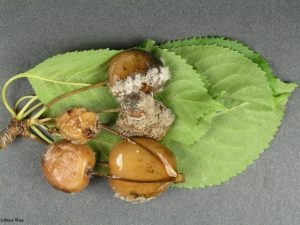 The fungus spends the winter in mummified fruit on the tree and on the ground, in infected twigs, and perhaps as individual conidia produced during the fall of the year. About the time the trees are in bloom, tiny mushrooms (apothecia) may grow from the mummies which have fallen to the ground. Apothecia produce ascospores which are forcibly ejected into the air. 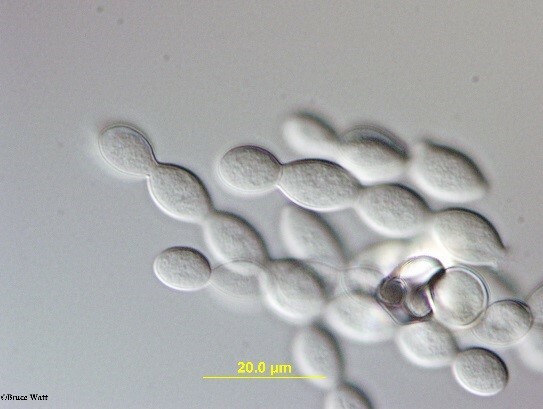 Ascospores are produced for about two weeks after which the apothecia disintegrate and no longer contribute to disease spread. 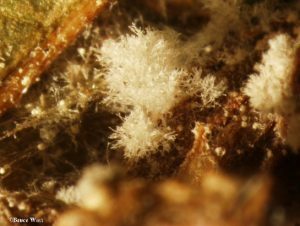 Although apothecia may not be produced every year, conidia are. Conidia will form on all overwintered, infected tissues including mummies and branch cankers. 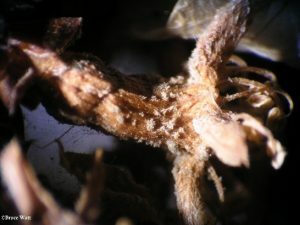 Both types of spores can infect the blossoms in the spring, renewing the disease cycle. As with most fungi, the severity of brown rot is dependent on the weather. Summers with much rainfall and high humidity lead to the greatest disease incidence. The fungus can grow slowly at near-freezing temperatures but it grows best at about 70-75°F. The fungal spores require free water to germinate and infect tissues and this water may come from rainfall or dew. Periods of 3-5 hours of wetness are required to initiate fruit infection and fruit injured by insects, hail, etc. are more susceptible. Fruit infections arise from spores that are produced on recently blighted blossoms and cankers. It is important, therefore, to control the blossom blight phase of the disease. Remove all fruit from the tree and from the ground and prune out infected twigs after harvest. Burn, bury, or otherwise remove these infections from the orchard. This practice will reduce the number of spores present the following season. Destroy wild Prunus spp. in the vicinity of the orchard because they may harbor the fungus. Prune the trees to maintain good air circulation which will promote rapid drying. Sprays to control the blossom blight phase are the most important. Fruit should also be protected during the three week period before harvest. The following table lists labeled fungicides. See labels for specific timings of sprays. Adaskaveg, J.E. et al. 2005. Reduced-risk fungicides help manage brown rot and other fungal diseases of stone fruit (PDF). Ellis, M.A. and M. Nitra. Organic Small Fruit Disease Management Guidelines, Integrated Management of Grape Diseases (PDF). Ogawa, J.M. et al. 1995. Compendium of Stone Fruit Diseases. American Phytopathological Society, St. Paul, MN. 2012 New England Tree Fruit Management Guide.